But these were real boys with real names. 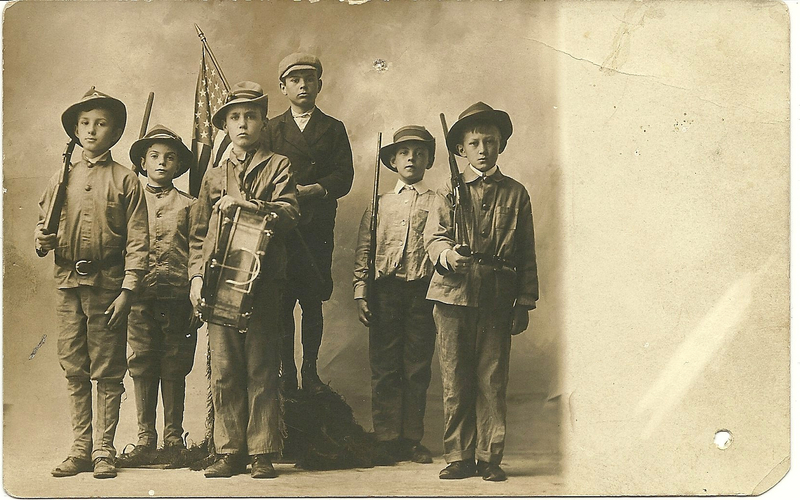 I haven’t been able to find out anything about the photographer, identified only by his last name, Whitehill; nor about the founding of the Boy Scouts in Westminster or Carroll County. I have learned, however, a bit about the origins of scouting that helped me better understand the image. And I was able to trace the boys’ lives and family histories to a certain extent. Although the scouting movement had many precursors and tributaries, one way to date the origin of scouting is the 1908 publication of Scouting for Boys: A Handbook for Instruction in Good Citizenship, a short book penned by Robert Baden Powell. Powell saw how lack of preparedness had hampered self-defense of English settlements in South Africa during the Boer War, but he had also observed the surprisingly effective ways that boys jumped into the breach as messengers and look-outs. As “Camp Fire Yarn No. 1,” his guide includes a foundational narrative for Scouting: “Mafeking Boy Scouts.” In this tale he recounts the vital role that boys played in the defense of a South African English settlement in 1899-1900. “Every boy ought to learn how to shoot and how to obey orders,” wrote Baden-Powell, “else he is no more good when war breaks out than an old woman. . .” (10). After his experiences in the English military, Baden Powell worried that what was viewed as the feminizing influence of urban work had sapped men’s ability to defend themselves and their communities, abilities that would be urgently needed to fight for England’s empire. He advocated the notion that by following a few simple, martial rules, groups of boys, even without an adult leader, could self-organize into “patrols” that could teach themselves physical fitness, self-reliance, and key skills for outdoor survival and self-defense in times of war and emergency. He also viewed scouting as a way to instill norms of good citizenship many believed were being eroded by anonymous urban living. As David McLeod articulates in his 1983 social history Building Character in the American Boy: The Boy Scouts, YMCA, and Their Forerunners, 1870-1920, “Boy Scouting drew upon an anxiety to mold the rising generation into a cohesive, hard-working citizenry–patriotic, disciplined, and conventional in values” (130). Baden-Powell’s ideas were taken up with enthusiasm in the United States after 1910 as concerns about German militarism grew, and that’s about the time I think this photograph was taken. Robert Howell Bohn (1899-1922) was the son of Westminster butcher Samuel W. Bohn and and Carolyn M. Frizzell (1878-1964); fellow Scout Robert F. Dinst (see below) was his maternal cousin. Unusual for the day, Carrie divorced Samuel Bohn, married Maryland Trust employee Charles Hellen (1880-1956) and moved with her son to Baltimore after 1910. Robert Bohn died at the age of 23 on 28 March 1922, at the home of his uncle, Meade Ohler, in Westminster. Robert is buried in Westminster Cemetery, Westminster, Md. The Bohns may have been associated with the German Baptist Church, possibly Beaver Dam Church of the Brethren in Frederick County. The Bohne family came to Frederick County well before the American Revolution; a great deal of genealogical research exists on the Bohne/Boone families in the United States. James Chesley Bond “Jack” Worthington (1900-1983) was the son of prominent, Yale-educated Maryland attorney Richard Hardesty Worthington (1872-1927) and Eloise “Ella” Bond. In 1910, the Worthingtons lived with Ella’s parents, prosperous local attorney James A. C. Bond and Selena W. Bond. Jack seems to have been a bit of a n’er do well and an adventurer; he was apprehended as a stow-away on a ship from Southhampton, England to New York in 1923; he gave his occupation as “reporter,” but no residence. He died in Pinellas County, Florida; I have not been able to learn his place of burial. The Worthington lineage goes back to Annapolis in the late 1660s with a Captain John Worthington; part of their history is recorded in The Founders of Anne Arundel and Howard Counties by Joshua Dorsey Warfield. Lawrence Bruce Fink (1900-1984) was the son of successful Catholic attorney Charles E. Fink and Eliza (Key) Boyle. Lawrence attended Western Maryland College, where he participated in the Student Army Training Corps (SATC). He became the postmaster of Littletown, Adams Co., Pa. and manager of the Shriver Canning Company. He and his wife Mildred had three children by 1940: Agnes, Elizabeth, and Lawrence Jr. Lawrence Sr. is buried in St. Johns Cemetery, Westminster, Md. Charles E. Fink, who graduated from St. Mary’s Seminary and University in Baltimore, was a founder and director of the Fidelity and Deposit Company of Maryland, and served as State’s Attorney for Carroll County 1891-1895. Harvey Roby Shipley (1901-1983) was the son of farmers Joshua Wilbur Shipley and Ella M. Parrish, and descended from a long line of Woolerys district farmers. The Shipleys were early members of Bethesda Methodist Church in Sykesville, founded in 1810. After working on the family farm, Harvey went into produce trucking and founded the Harvey R. Shipley & Sons Trucking Company of Westminster. He is buried in Deer Park Cemetery, Smallwood, Carroll Co., Md. John W. Shriver (1901-1982) was likely the son of lithography salesman William J. Shriver and Julia Lynch. In 1910, John lived on E. Main Street with his parents and maternal grandparents, John T. and Mary E. Lynch. John Lynch was a prosperous horse dealer and farmer. John Shriver may have descended from Carroll County farmer Andrew Keiser Shriver (1802-1884), grandson of Maryland Militia member Lt. Col. David Shriver (1735-1826). John W. Shriver is buried in New Cathedral Cemetery, Baltimore, Md. Robert Franklin Dinst (1900-1987) was the son of Pennsylvania-born grocer Herman M. Dinst (1868-1939) and Anna Frizzell (1870-1942). Robert Franklin’s mother and Robert Bohn’s mother, Carrie Frizzell, were sisters; Robert’s grandfather, Francis A., or “Franklin” Dinst (1832-1909), as he called himself, immigrated from Germany in the 1830s with his parents Anthony and Mary, and rose to “master of repairs” for a railroad in Oxford, Adams Co., Pa. Originally of Lutheran heritage, Franklin and Herman Dinst appear to have joined the Methodist Church in York, Pa. The Frizzells were prosperous farmers in Union Mills. Robert Dinst joined the US Navy in 1918 but apparently never saw combat. He is buried in Meadow Branch Cemetery, Westminster, Md. Did the patrol thrive and become a troop? Did they stay friends, or did they drift apart? There is so much I would like to know. But for now all I can say is this: In this moment Baden Powell’s little book brought six boys from very different backgrounds–farmers, attorneys, and small merchants; Catholic, Methodist and Brethren–together as young citizens pledged to a common code. yes, Harvey Roby Shipley was our grandfather. Neither one of us ever heard a story about Pop being a Boy Scout! Jan, I am so glad you got in touch! I will contact you via email. Thanks for visiting my blog, Diane. Are you related to Harvey Roby Shipley, by any chance? Was he, indeed, an early Westminster Boy Scout?